Tom Joyner (not the same one who does the syndicated morning show), owner of radio stations in North Carolina and Wisconson was, in 1988, in the process of buying Martinsville's 96.3 WMVA-FM. He intended to move the tower to Cahas Mountain near Boones Mill, VA and the FM studios to Roanoke. Joyner realized that by purchasing a station such as WROV-AM and using those historic call letters for the new FM, he would have access to an existing organization and a presence in the market—two things that would take him years to develop if he came in as an outsider. Though at first he wasn't sure if the FM would be country, rock & roll or urban contemporary, he knew that having the WROV call letters and legacy would enable him to hit the ground running. So in September, 1988, Joyner purchased WROV-AM from Burt Levine, for a price that was said to be "in the neighborhood of $500,000.00." He then began the process of pairing WROV-AM with an FM sister station for the first time since Burt sold the original WROV-FM equipment and turned in the license in 1955. New Logos with accompanying bumper stickers for the new FM and the now "all oldies" AM. To accelerate the process, Joyner hired as GM Mike Slenski, who worked for Joyner in Raleigh, NC, to run both WROV-AM and WROV-FM. Mike referred to himself as a "turnaround specialist" (which basically means a corporate takeover and format-changeover expert). To help determine the format of the station that would become WROV-FM, station officials did a survey. A toll-free number was set up and on-air announcements on the AM and FM stations asked listeners to vote. Questionnaires were also distrubuted throughout the FM's new coverage area. Almost 2,000 people responded and of them, 86% voted for classic rock, album rock, oldies, or some mix of the three. The final decision was announced at 10:45 at Roanoke's now traditional New Year's Eve party at the City Market. The almost 20,000 who attended heard Mike Slenski announce that the format would be "pure rock 'n' roll." This was followed by the Rolling Stones' song "It's Only Rock And Roll" being blasted from the on-stage sound system. The call letters, which originally stood for "ROanoke Virginia" were now said to stand for "Rock Of Virginia", a more regional sounding phrase coined by John Andrews. 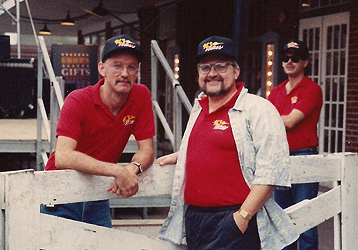 Mike Bell and Mike Slenski at an event on the City Market in 1989. That's John Andrews in the background, looking on. 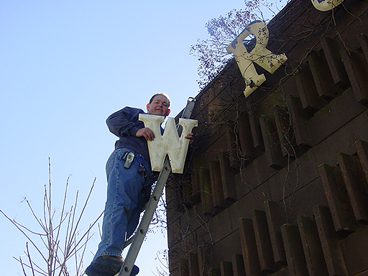 The moving of the tower and studios was completed in January, 1989 and Roanoke now had a new FM station, WROV 96.3, which carried on the rock tradition of it's older "sister." The WROV-FM studios were built in what had formerly been sales / continuity offices on the rear side of the building at 15th and Cleveland. 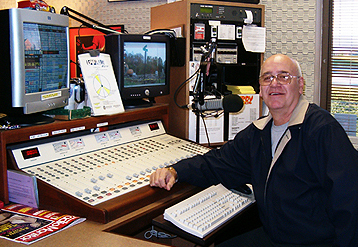 With the sign-on of the new FM station, WROV-AM changed over to what Mike Slenski called a "classic oldies" format of music from the fifties, sixties, and seventies with Mike Bell staying on as the AM program director. Burt agreed to stay on for two more years in the role of consultant, and felt that the ownership changes would eventually make the WROV call letters Number One in the market again, as well as give his existing employees new opportunities. So, Burt's thirty-three years of owning WROV finally came to an end in November, 1988. He would spend his last years working as a volunteer consultant in marketing and development for public radio station WVTF-FM. 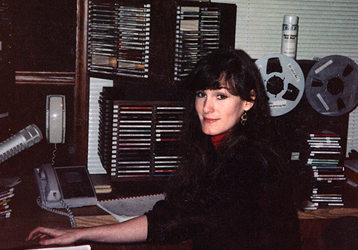 Ellen Flaherty, voted "Best Area DJ" in a 1989 Roanoke Times / World News reader's poll, in the original FM studio at 15th & Cleveland. Burt left WROV with no bad feelings, no animosity, only a feeling of having accomplished what he set out to do and a sigh of relief. "When you've been coming through a dark tunnel for many years, just coming out into the light is extremely exciting" said Burt. "It's time to push me out of the nest. Everybody's grown up, and it's time." In 1987, Bart Prater left K92 and formed the Prater/Palmer advertising agency with Fred "Quiddly" Palmer. When this didn't work out, he returned to WROV where he worked part-time on the weekends for the FM and held down a full-time shift on the AM. By late 1989 he'd stopped doing weekends on the FM saying that it "wasn't his thing." He was let go in 1991 when the station "plugged in" the Oldies Satellite Network. He then took a job doing engineering, then became the operations manager at WVTF-FM. 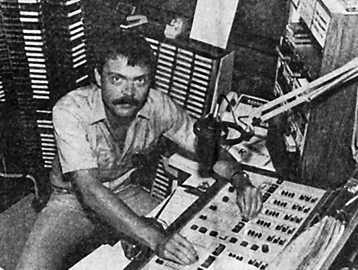 "Old Bart" at K92 in 1984. Needing more space, a fourth addition to the original quonset hut was added in the 1990s, built on the grassy area outside of Burt's former office and connected to there by a hallway. The new part resembled a "pre-fab home" and this prompted Sam Giles and Mark Nelson to call it the "rock and roll double-wide." Unfortunately, the surrounding neighborhood continued to deteriorate. Things really became serious when someone fired a high-powered rifle through the FM studio window one night. The perpetrator was never caught. Burt passed away on April 4, 1995, at age 70, six months after Muriel succombed to her health problems that began in 1983. Always one to help his community, Burt, in his last act, asked that memorial contributions be made to Roanoke's Community School and Beth Israel Synagogue. Much can be said about Burt's contributions to the Roanoke Valley. The Rock & Roll Doublewide can be seen to the left of the original building in this shot from 1995. That's Ellen, Dave O'Brien and Howard Petruziello under the call letters. He was active in many religious, civic and professional organizations which sought to bring people together and promote tolerance, understanding and compassion for others including the National Conference of Christians and Jews and the Community Task Force on Race Relations. Burt loved Roanoke, and Roanoke became a much better place because of his being there. Joyner sold WROV AM & FM to Weil Enterprises of Goldsboro, NC in 1992. Weil Enterprises sold them to Benchmark Broadcasting of Baltimore in 1996, and then a few years later Benchmark sold it to Capstar Broadcasting of Austin, Texas. 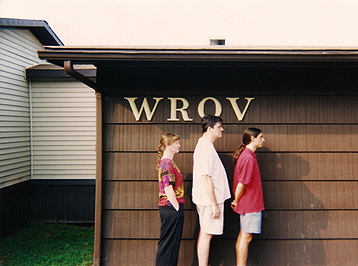 WROV-AM quit broadcasting live and began simulcasting the programming of WROV-FM in 1998, this to save money while Capstar decided what to do with the station. 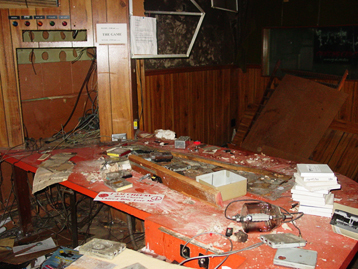 Tearing down the station on November 9, 2004. Sad! The last live announcer on WROV-AM was Larry Bly, who ended its final show by playing Don McLean's hit "American Pie" (with lyrics "the day the music died"). When it was over, Larry flipped a switch which put the FM programming on the AM, signed off the logs, and went home where he spent the rest of the day, depressed, pondering the significance of the moment. A few months later on September 1, 1998, the call letters of the AM were changed to WGMN, and the station began broadcasting an all-sports format and calling itself "The Game" after its sister station, WVGM in Lynchburg. Both WGMN and WVGM began simulcasting the same programming--most of it syndicated--twenty-four hours a day. Shows included Don "Imus in the Morning" from WFAN, New York; the Fabulous Sports Babe; Tony Kornheiser of the Washington Post then ESPN Radio at night. WROV's Brian Davis continued doing his call-in show and Jim Carroll stayed on as the valley's most well-known sportscaster. Bucky Stover saved the call letters and much of the rest of our history that day. 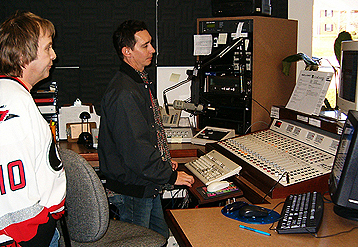 Prompted by the need for more space, the declining condition of the area known as "P. D. Bottom" and the recent gunshot through the window, WROV-FM moved to new studios on Brandon Avenue in June, 1999, and a few months later, WGMN and WVGM followed them, leaving the original studios at 15th and Cleveland Avenue sitting silent for the first time since Burt moved there from the Mountain Trust Bank building in 1955. The last guy on the air live from 15th and Cleveland was Jim Tarantino. Jim was the board op and guy who read the local news during the Don Imus show. Jim recalls "WROV FM had moved out and for 3 months I was the only person in the building each morning. The place was pretty run down as you can expect, years of DJ's punching holes in the wall and tiny mammals looking for a meal! I often felt the ghosts of so many who cared for and loved that place." One last look at the studio where so many memories were made. "When the FM station moved out everything really started to crumble. Equipment was being torn out every day and there was trash everywhere. So depresssing, because I felt that the place was special and historic and some, most or all should be preserved. One day Steve Cannon and I looked up in the attic and found old tapes with jingles and other sound. I wonder, if we didn't pull that out of the wreckage if all that would have been lost forever. When I say ghosts of the past, I say that with respect and reverence, and not just for the dead!" The new studios were home to all four Capstar stations in the market and contained four studios and four production rooms, all digital. Capstar Communications was purchased by Clear Channel Communications in 2000. And in June, 2007, things went "full circle" so to speak. Jay Prater was hired as afternoon personality and program director of WROV-FM, the job his dad had throughout most of the 1970s. Starr Stevens tries out the air chair of 96.3 WROV. 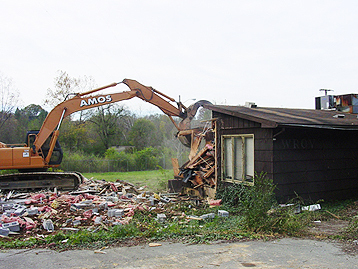 In November, 2004, the building was torn down. Long neglected, the building leaked, was full of trash and junk that wasn't taken along on the move to Brandon Avenue, and had become a haven for homeless people, bums and all sorts of verminous critters. At the last minute, though, the Gates Diplomat board--through which Roanoke's main source of rock & roll had flowed for years--was saved, along with a few other artifacts that are now being restored by former employees and will end up in a museum one day. Three days after the building's demolition began, all that remained was the original Quonset Hut, and it was destroyed by a suspicious fire that broke out in the middle of the night. Steve Cannon shows the WGMN studio to Pat Garrett. One month later, Jim Carroll, the last survivor of WROV's "Burt Levine" years, hung up his headphones and retired from doing area high school sports broadcasts--something he had done on both WROV and later WGMN for 43 years. But there's a happy ending! Most of the surviving former WROV-AM personalities began corresponding through e-mail in 2003 and having yearly reunion parties in 2004. From this, came the ideas that became the WROV History website. We hope you've enjoyed it. 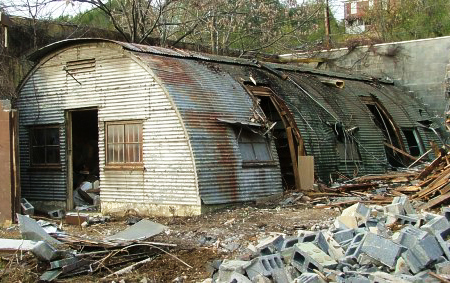 The original quonset hut. Sadly, it took tearing down the rest of the building for us to see it again. In the dressing room of the Montreal Canadiens hockey team, the names of all former players are listed on name plates above the stalls and pictures of the most famous players adorn the opposite wall. Above these past superstars are the words "To you, from failing hands, we pass the torch; be yours, and hold it high." That is the message that we, the "old guard" of WROV-AM, wish to pass on to our brothers and sisters of 96.3 WROV - The Rock of Virginia. Please listen to them when you're in Southwest Virginia and visit their website. They are carrying on a tradition of Roanoke broadcasting excellence begun years ago by Roanoke Radio, Incorporated and fully realized by innovative radio genius Burt Levine and all of us who worked for him. 15th & Cleveland. 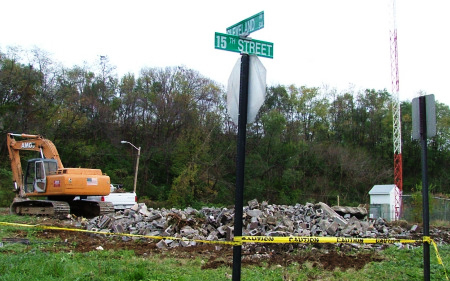 The address you heard mentioned thousands of times is now a vacant lot. Bart Prater said it best: "If any one person deserves credit for the success of WROV and the vast majority of other good things that occurred over the years in Roanoke radio, it is Burt Levine. He raised the bar in local broadcasting to the point that record producers, national publications and top radio executives were all quite aware of the market. Through his charitable and social work, Levine underlined the fact that radio stations were licensed 'to serve the public interest.' He improved not only the quality of radio, but the quality of life in the Roanoke Valley. He is missed."